The Izodom products, manufactured with special methods from the best materials, have been monitored for twenty years and have a favourable opinion from the National Institute of Hygiene. It is worth mentioning that the Polish Mother’s Memorial Hospital - Research Institute in Łódź, Poland used the EPS supplied by our company to fill special anti-decubitus mattresses for premature infants. 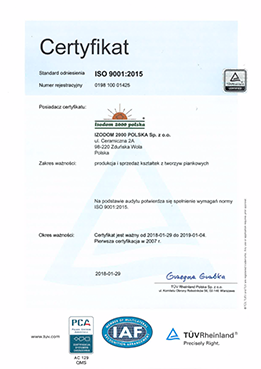 Izodom applies very rigorous quality control procedures, certified by the ISO 9001:2015 accreditation which we received in 1996. The advantages of Izodom technology is also certified by a French document: DTA - Document Technique de Application.